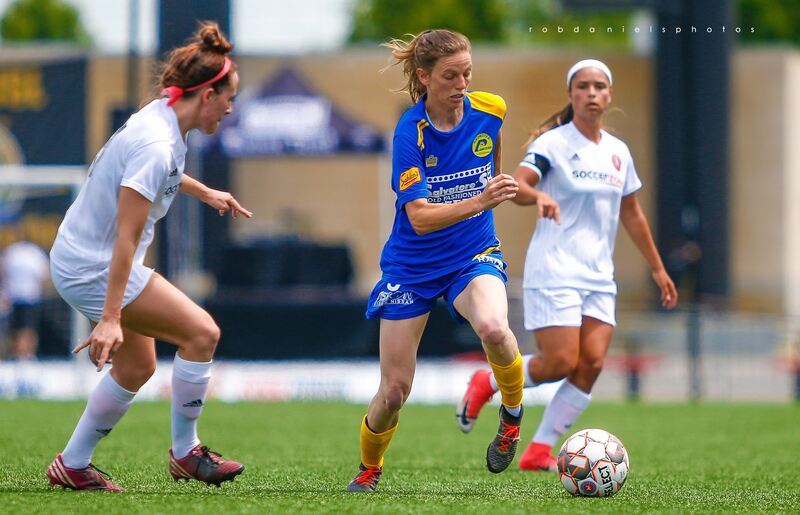 The roll was fun while it lasted for the Rochester Lady Lancers. Now the real work begins. Between June 9 and June 17, they rattled off three consecutive victories and vaulted to first place in the East Conference of United Women’s Soccer. But unless you keep winning, unless you keep playing well and taking advantage of opportunities, first place can be taken away. The Lady Lancers learned that the hard way in the sweltering heat Saturday afternoon. The Western New York Flash scored early, built the lead to 2-0 and then held off the ever-attacking Lady Lancers for a 2-1 victory on the pitch of Charlie Schiano Sr. Field at Marina Auto Stadium. As a result, the Flash leap-frogged Rochester and took over the top spot in the East. Playoff berths go to the top two teams, with the regular-season champion earning home field for the game. Thus, the Lady Lancers final two games — home with the Lancaster Inferno next Saturday and at the Flash on July 14 — will be critical. Truth be told, there’s not much more the Lady Lancers could have done to change the results on Saturday. They outshot the Flash by a mind-boggling margin of 28-7, including 15-2 in the second half. But too many shots weren’t on target or were forced to be taken in a hurried fashion. As a result, just one, by forward Taylor Wingerden in the 67th minute, found the net. “We executed the plan without scoring goals,” coach Sal Galvano said. Part of that plan was to take advantage of a full roster and make strategic substitutions of fresh legs because the Flash had just three extra players. The “feel-like” temperature soared to around 104 degrees in normal areas of Rochester in mid-afternoon. But it was even hotter on the fake grass of the downtown soccer stadium. The Flash were, however, able to withstand both the heat and the attack of the Lady Lancers. Indeed, the Lancers had high-quality chances that missed the net, including a free kick just outside the penalty area by UWS leading-scorer Brooke Barbuto that sailed high, and later on a great run by Wingerden that ended with a terrific diving save by Emily Kelly. Once Carissima Cutrona scored her first of two goals, in the 43rd minute, the Flash were very content to pack the middle and defend. Cutrona scored again in the 66th minute after a fabulous attack into the right side of the penalty area but Wingerden came right back off the next possession and cut the lead to 2-1 in the 67th minute. The Lady Lancers, however, weren’t able to produce the tying goal. By the time the weekend is over, five teams could be separated by three points. “It’s really competitive across the entire league and it makes it really enjoyable because you have that competition,” Wingerden said.